Chandelier earrings are back, and bigger and glitzier than ever. After years of minimalist, dainty studs and teeny tiny hoops, shoulder-grazing statement earrings are everywhere. 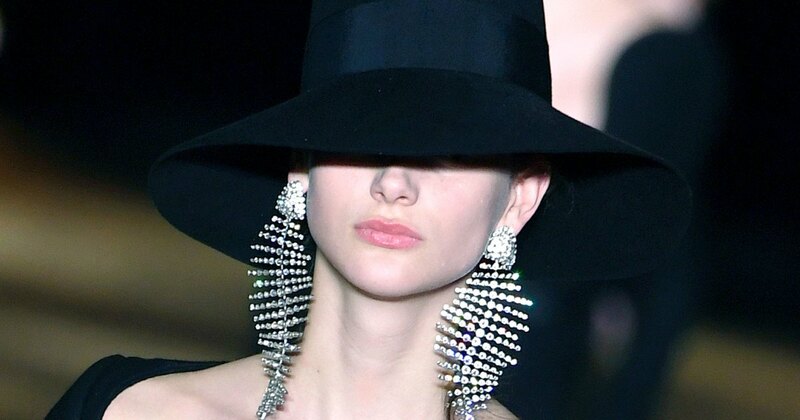 On Instagram, all the fashion girls seem to be in a secret competition to see who can wear the bigger and blingier earrings. Every holiday editorial shoot seems to have at least one pair, and even Meghan Markle recently wore a pair. Although, we’re pretty sure hers are real diamonds. There’s nothing subtle about these looks, but that makes them perfect for a party where you want to make a killer impression. But the beauty of this high-impact trend is that you can wear them with practically anything. Alessandra Rich’s over the top pairs are everywhere on Instagram, and have a definite 80s flair to them. If you’re looking for a little more color, then Rebecca Minkoff and Dannijo have you covered with their rainbow hued offerings. Of course, I’ll be bringing mine out to pair with an off-the-shoulder little black dresses and a killer red lip. But they work just as well with a t-shirt and jeans, or trousers and a crisp white blouse. Or my personal favorite? A thin black turtleneck, hair tucked in, so the earrings really have the chance to shine.